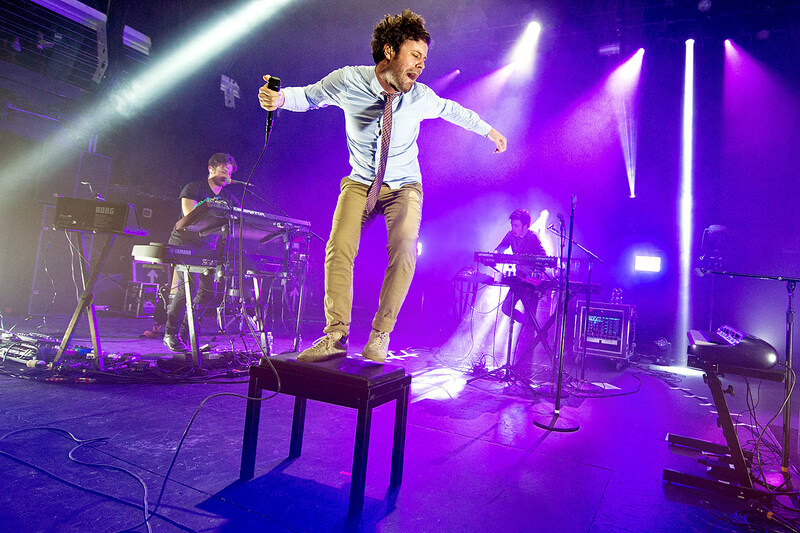 Passion Pit will be celebrating the 10th anniversary of their 2009 album Manners with a North American tour this spring, which includes a now sold-out NYC show at Pier 17 on 5/21. They’ve just added a second Pier 17 date on 5/19, with tickets going on sale Friday (3/1) at 10 AM, and a presale beginning Tuesday (5/26) at 10 AM. The band will also be appearing at the two-day Just Like Heaven Fest in Long Beach, CA in May. You can find all updated Passion Pit dates here. As part of their Walking on a Dream 10th anniversary tour, Empire of the Sun recently announced two NYC dates at the soon-to-reopen Webster Hall on June 6 and 7. Tickets to both shows sold out fairly quickly, so the band has revealed a third date at the venue on 6/8. Tickets to that date go on sale Friday (3/1) at noon, with a presale going on now. Check here for all updated dates. UK-based Shakey Graves released the impressive, psychedelic Can’t Wake Up last year, and he’s continuing to tour behind the album, having just announced a bunch of 2019 tour dates, half of which are co-headlining dates with Philly rockers Dr. Dog. He’ll begin his tour in New Orleans this May for a leg with openers Illiterate Light, before joining with Dr. Dog for two shows in NYC (venues TBA), in addition to shows in Milwaukee, Philly, Boston, Dallas, Houston, Minneapolis, and many more. Caroline Rose and Liz Cooper & The Stampede will serve as openers for both acts in certain cities. Check here for all upcoming dates. Three ’80s-era alt-rock groups are going on a package tour this summer, headlined by anthemic Welsh group The Alarm, plus “I Melt with You” singers Modern English, and the Jay Ashton led lineup of gothy/glammy rockers Gene Loves Jezebel. (Jay’s identical twin brother Michael has his own lineup of the band as well.) The tour kicks off July 19 in Austin and includes stops in Dallas, Oklahoma City, San Diego, Los Angeles, San Francisco, Portland, Seattle, Denver, St. Louis, Minneapolis, Chicago, Detroit and more, with the trek wrapping up August 29 at Asbury Lanes in Asbury Park, NJ. Meanwhile, the Alarm play NYC shows on April 12 at Gramercy Theatre and April 13 at Irving Plaza. All dates are here. The Alarm have a new album, Sigma, out later this year and frontman Mike Peters was just honored with an MBE (Member of the Most Excellent Order of the British Empire) Award by HIs Royal Highness Prince Charles Prince of Wales at Buckingham Palace. Congrats, Mike! Inventive British psych/electronic duo The KVB were about to start a North American tour, but due to some unfortunate visa issues, these dates have been rescheduled from March to October and November. “We are extremely disappointed that we cannot come in March, and did everything we could to make it work out, but sadly it wasn’t possible,” the duo said on Facebook. All ticket purchases will be transferred to these new dates, and refunds will be available. You can head here to view all the new dates, including a Brooklyn show at Baby’s All Right on 11/1. Rising UK songwriter Freya Ridings continues to gain buzz ahead of the release of her self-titled debut LP (out in May). Having played NYC last month, she just announced a return to the city at Bowery Ballroom on 5/13, which follows an extensive European tour throughout March. Tickets for this show go on sale Friday (3/1) at noon EST, and this is her only upcoming North American date at the moment. All dates can be found here. Aussie garage rockers Gooch Palms are gearing up to release their upcoming third LP, simply titled III, on May 10 via Ratbag Records/BMG. In support of the album, the duo have announced a run of North American tour dates happening in March and April. The tour kicks off in Los Angeles, before hitting lots of other cities such as NYC (Trans-Pecos on 4/4), Toronto, Baltimore, New Orleans, San Antonio, Phoenix, Minneapolis, Seattle, Portland, and lots more. They’ll also be stopping at SXSW in Austin next month. All dates are listed here, and you can check out the band’s new video for single “Are We Wasted?” below. Long Island natives and ’80s rockabilly hitmakers The Stray Cats reunited after a long break last year, and they’re continuing to tour, with U.S. dates emerging for late summer. So far only two have been announced: NYC’s Pier 17 on 8/6, and Vienna, VA’s Wolf Trap on 8/13. The band also has tons of European shows in June, hitting London, Amsterdam, Berlin, and many others. Head here for all upcoming dates. It’s been a while since Hot Chip released 2015’s Why Make Sense?, and although they haven’t announced a follow-up, the band have just revealed some spring tour dates including NYC & LA shows. Anyone nostalgic for ’90s alternative metal, it’s time to get stoked. Korn and Alice In Chains (who have been active with the late Layne Staley’s replacement William DuVall for over a decade now) announced a co-headlining tour for this summer. Metal icons Iron Maiden have added more shows to their summer “Legacy of the Beast” tour, including additional shows in NYC and Mexico City. Montreal motorik psych postpunks Pottery just announced their debut EP (out in May on Partisan) and that they’ll be on tour with Viagra Boys. They’ll also be at SXSW, including BrooklynVegan’s Thursday day party. South Korean post-rock group Jambinai, who incorporate traditional Korean instruments into their sound, are coming over for SXSW in March and Coachella and NYC in April and visit NYC as well. All dates are here. Touche Amore have added a second NYC show to their 10th anniversary tour for their debut album with their old pals Pianos Become the Teeth.